Someone vague familiar with systems thinking might think this to be a warning. Systems thinking must be some very big academic subject with a lot of information to plough through. Not so. The primer is a cute little book, barely over 200 pages, in a comfortable font size with straight writing. 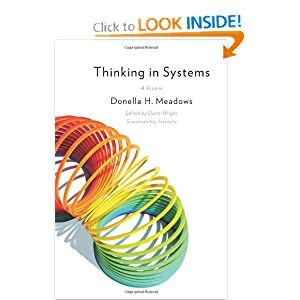 Donella Meadows writes clearly and simply to illustrate the principles and power of systems thinking. The concepts of stocks and flows, reinforcing and balancing loops are all illustrated with great clarity. Reinforcing loops – that’s the technical term for what we term as vicious or virtuous cycles – the spirals. Balancing loops refer to a system or sub-systems that tend to check their own growth – so predator-prey relationships are a class of balancing loops. The most important nuggets for someone interested in introducing changes in systems would be in the last chapter, where she lists out 12 ways to change the behaviour of a system. I won’t go through all 12 here, although a list is available on Wikipedia. 4. Self-organisation – allowing for systems to change. 3. Goals – what is a system for? 2. Paradigms – what are the assumptions that underly the premises of a system? – Locate responsibility in the system – design for intrinsic responsibility. I can imagine these things be applied to all sorts of systems, especially socio-political cultures. Systems thinking is undoubtedly an important mental toolkit to figure out how the world works and how to enact change in it. When we think about the things we want to change, the usual linear logic is to identify problems and figure out the individual factors that contribute to a particular problem. Systems thinking re-frames the entire trajectory of change, and examines the whole ecosystem behind the problem. Anything, from the economy to poverty to transportation issues are usually amenable to systems-thinking analysis, although they present us with the issue of how to isolate the specific issue. Unfortunately, bounding the system is something that’s not discussed as much – I can guess that can only come about with actual experience and practice in doing systems-thinking.